Overview: Cheyenne - the name brings forth romantic images of the West - cowboys, rodeos, railroads and majestic plains. The town&apos;s slogan, "Cheyenne - Live the Legend," is an invitation to step back into the Old West. As the nation&apos;s rodeo and railroad capital, the city is home to Cheyenne Frontier Days, the world&apos;s largest outdoor rodeo, and Big Boy, the world&apos;s largest steam engine. Cheyenne is also surrounded by some of the nation&apos;s most beloved natural monuments. Mt. Rushmore, the Black Hills, Devils Tower, Yellowstone National Park, Grand Teton National Park and Rocky Mountain National Park are all within a day&apos;s drive of the city. Enjoy a walk through the past and come experience the "Legend of Cheyenne," a magical place that captures the imagination of the American West in the midst of the beauty of the high plains. Location: Cheyenne is located near the geographical and time center of North America and is strategically situated at a major transportation hub - the intersection of U.S. Interstates 25 and 80, as well as two major railroads. Cheyenne is located only 90 minutes north of Denver and sits as the northern anchor of the Front Range of the Rocky Mountains. Transportation: Great Lakes Airlines offers daily flights from Denver to Cheyenne. Climate: On average, there are 236 sunny days per year in Cheyenne. The July high is around 83 degrees and the January low is 18. Our comfort index, which is based on humidity during the hot months, is a 68 out of 100, where higher is more comfortable. The US average on the comfort index is 54.
Business Climate: Cheyenne is an active economic center for the northern plains and is strategically located at major transportation and communication hubs. * The Cheyenne-Laramie County Corporation for Economic Development (LEADS) is a not-for-profit organization serving as the economic development entity for the City of Cheyenne and Laramie County, Wyoming. LEADS can assist non-retail businesses in all phases of relocation or expansion in the area. * A 2011 report by the U.S. Chamber of Commerce and the National Chamber Foundation entitled ‘Enterprising States: Recovery and Renewal for the 21st Century&apos; ranked Wyoming as #1 in the nation for Long-Term Job Growth, Per Capita Income Growth, Gross State Product Growth and Productivity Growth. Wyoming is ranked as the #3 Top Growth Performer, placing first in four of their seven performance measures: long term job growth, GSP growth, productivity growth, and per capita personal income growth. "Western" Climate: Cheyenne was named a "True Western Town" by True West Magazine. The city was recognized for its Frontier Days and other events, as well as the renovation of the Wyoming Home/Tom Horn Building, the Cheyenne Depot and Plaza, and recognition of Native American heritage on the Belvoir Ranch. History: On July 4, 1867, the first tents were pitched on the site now known as Cheyenne. The Sioux Indians gave the name Cheyenne, which means "aliens" or "people of foreign language" to the Indian tribe "Dzitsistes," who roamed the open plains in the region. The first residents were men who moved west to work on the Union Pacific Railroad. By 1869, Cheyenne was home to a variety of residents, including railroad gangs, soldiers from Fort D.A. Russell (which is now F.E. Warren Air Force Base) and employees from Camp Carlin, a supply camp for all the northern posts on the Indian frontier. By 1880, the cattle industry began attracting many wealthy men from the East and Europe. Many cattle barons spent their summers in Cheyenne and wintered in Europe. It was during this time that the world famous "Cheyenne Club" was formed. Its membership included many of these refined cattle barons. The club was lavishly furnished like a club of its scale in England. * Historic Downtown Walking Tour: Pick up a free brochure at the Depot Visitor Center and take a self-guided walking tour of downtown Cheyenne. The tour includes the old Union Pacific Depot, the beautiful Tivoli Building and other examples of how Cheyenne has captured the imagination of the American West. * Cheyenne Street Railway Trolley: Jump on board for a fully-narrated historic tour of Cheyenne. The trolley operates from May through the end of September. * Horse Drawn Carriage Rides: Enjoy a narrated tour of Cheyenne&apos;s quaint downtown on a beautiful horse-drawn carriage. Rides run from May through September, weather permitting. * Cheyenne Frontier Days: Cheyenne Frontier Days is the world&apos;s largest outdoor rodeo and Western celebration. Started in 1897 and occurs annually the last full week of July. CFD features 10 days of the world&apos;s best PRCA rodeo action and Western entertainment and hospitality at its finest. Cheyenne Frontier Days Old West Museum & Store: Pioneer life in the American West comes to life in this museum. A premier cultural center in Southeast Wyoming, the Cheyenne Frontier Days Old West Museum & Store offers year-round programming, exhibits and activities that celebrate the spirit of the American West and the thrilling history of Cheyenne Frontier Days. * Nelson Museum of the West: The museum is dedicated to the objects comprise the largest part of the museum&apos;s collection of more than 3,700 artifacts. * Cowgirls of the West Museum & Gift Store: This museum highlights the substantial contributions that cowgirls have made to the area&apos;s history and features rodeo outfits and other memorabilia. The gift store has a variety of Western items and Western/rodeo paintings. * Terry Bison Ranch: Located seven miles south of Cheyenne, the ranch consists of nearly 30,000 acres of rolling hills and lush grasslands and more than 2,300 grazing bison. Features great Western entertainment, including train tours of the bison herd, horseback riding, Kid Corral, old time photo studio, Trading post, fishing, old-west restaurant and saloon and overnight accommodations. * Cheyenne Gunslingers: In June and July, enjoy the Western skits and escapades of the Cheyenne Gunslingers in Old Town Square in downtown Cheyenne. Great photo opportunities. * Messenger Museum: Features authentic Western displays, carriage owned by Buffalo Bill Cody, saddles and pistols dating back to 1810. * Bit-O-Wyo Ranch Horse Barn Dinner Show & Trail Rides: During the summer months, enjoy an evening of Wyoming hospitality at the Horse Barn Dinner Show with a cowboy steak dinner followed by cowboy music and comedy performed by the Blue Water Cowboy Band. During the day, saddle up for a scenic trail ride featuring high ridges overlooking valleys and creeks. Western Rodeo: Shawn Dubie Memorial Rodeo - Held each October at Laramie County Community College Arena in Cheyenne and features three days of rodeo action from top collegiate rodeo talent. * Cheyenne Depot: Built in 1886 - 1887 and designated a National Historic Landmark, this former Union Pacific Depot has been beautifully restored to its original glory. Home to a visitor center, restaurant and the Cheyenne Depot Museum. * Cheyenne Depot Museum: Located at the Cheyenne Depot, the museum showcases the history and romance of the railroad with colorful exhibits and interactive displays. * Big Boy Steam Engine: Even in retirement, Old Number 4004 remains an imposing sight. The world&apos;s largest steam locomotive, this powerful coal-fired engine was designed to pull a 3,600-ton train over steep grades between Cheyenne and Ogden, Utah. Visitors can see Big Boy year-round in Holliday Park. * Ol&apos; Sadie: Located in Cheyenne Botanic Gardens in Lions Park, Ol&apos; Sadie is Wyoming&apos;s oldest steam engine. Built in 1890 in New Jersey, Ol&apos; Sadie ran the Walcott-Saratoga-Encampment branch line from 1921-1954. * Ames Monument: This monument was built in about 1881 as a tribute to Oliver and Oakes Ames, two brothers who were leaders in the construction of the transcontinental railroad. It&apos;s 60 feet tall, made of granite and located about 25 miles west of Cheyenne along Interstate 80. * Merci Train: France gave a gift-filled boxcar to each state in 1949 as a gesture of thanks for aid provided by the United States. The Wyoming boxcar&apos;s home is Cheyenne and is located at American Legion Post #6. 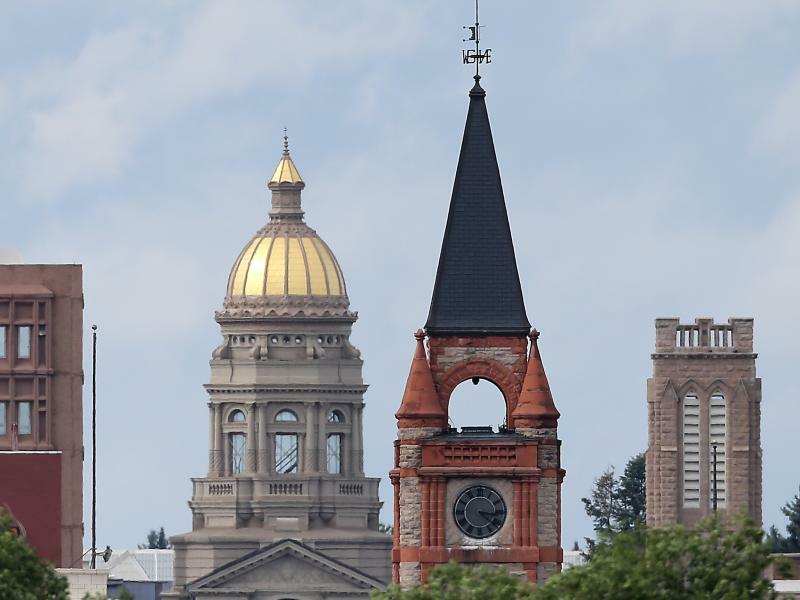 * Wyoming State Capitol Building: A National Historic Landmark (the cornerstone was laid in 1887), the Wyoming State Capitol Building is a dominant structure in the Cheyenne skyline. Historically, it is one of the most important buildings in the state. * Wyoming State Museum: Houses artifacts and collections showcasing Wyoming&apos;s history. The kids&apos; room features vintage clothing, toys and interesting artifacts. The gift shop includes souvenirs and an extensive collection of Wyoming books. * Historic Governors&apos; Mansion: Home of Wyoming&apos;s governors from 1905 - 1976. The mansion recently underwent $1 million in restoration and renovation work. * F. E. Warren Air Force Base & Museum: Originally named Fort D.A. Russell, then Fort Francis Warren. Today, it serves as a command center for U.S. Intercontinental Ballistic Missiles (ICBM) and as a training ground for the U.S. Air Force. The museum shows the history of Fort D.A. Russell up through the present F.E. Warren Air Force Base. It portrays life of the late 1800s in Cheyenne and on the military installation. It is also the home of the ICBM Missile Museum. The National Park Service excavated an archeology site in 1991 - 1992, and the base has an Archeology Interpretive Center near Crow Creek. Open to those holding a military I.D., with limited access to others. * Cheyenne Artists Guild: Provides numerous art shows throughout the year. Located in the historic Van Tassell Carriage Barn (National Historic Registry), the Cheyenne Artists Guild is the oldest continuously operating, nonprofit arts organization in Wyoming. * Cheyenne Little Theatre Players: A community theatre organization serving Cheyenne, the state of Wyoming, western Nebraska and northern Colorado. It owns and operates the Mary Godfrey Playhouse and the Historic Atlas Theatre. Cheyenne Little Theatre Players offer a year-round season of more than nine full-scale productions. * Deselms Fine Art: Features original art by local and regional artists with national acclaim. The gallery is located in one of Cheyenne&apos;s oldest homes. * Cheyenne Symphony Orchestra: Performs concerts at the Cheyenne Civic Center. * The Plains Hotel Restaurant: Located in The Historic Plains Hotel, offering creative cuisine of American Western classics featuring the finest, fresh Wyoming local ingredients. * The Senator&apos;s Restaurant & Brass Buffalo Saloon: Located at Terry Bison Ranch, this old-West restaurant and bar is open June 1 - September 30 for lunch and dinner and for breakfast during Cheyenne Frontier Days. * The Albany: Opened in 1942, The Albany is a family-owned restaurant and bar featuring American fare and time-tested and proven recipes developed by the Kallas family and staff. * Little Bear Inn: Located just north of Cheyenne, Little Bear Inn is a steakhouse the specializes in aged steaks that are cut in house. For seafood lovers they offer "World Famous Fancy Fried Lobster." * Outlaw Saloon: A complete country experience with several bars, a DJ, saw dust dance floor, pool tables and a mechanical bull. * The Bunkhouse: Favorite local watering hole just on the outskirts of town on Happy Jack Road. * Boot Barn/Wrangler: Western-wear for the whole family. * Cowgirls of the West: Specializes in art and cowgirl items. * The Wrangler: Shop for Western wear in the most Western of buildings. * Just Dandy: Perfect for apparel, boots and hats. * Sierra Trading Post: The catalog giant has an outlet store in Cheyenne featuring active outdoor apparel. - The 16th Street Mercantile/The Historic Plains Hotel - antiques, Western gift baskets and more. - Little America Gift Shop/Little America Hotel - art, clothing, children&apos;s gifts, Wyoming souvenirs and more. * Wyoming Home: World-class home furnishings that incorporate elements from the Southwest, mountain lodge, cowboy, Rocky Mountain, pioneer and ranch traditions. * All Wild & Western: Western-themed and Wyoming products for the home. * Brown & Gold: University of Wyoming merchandise. * Cheyenne Street Railway Trolley: The trolley, which operates from May through the end of September, features a fully-narrated historic tour of Cheyenne. For some seasonal fun, jump on board for a Ghost Tour in October and a Christmas Lights Tour in December. * "Wyoming Adventure" Miniature Golf: Includes 18 holes of fun with replicas of Wyoming&apos;s natural wonders, including Devils Tower, Old Faithful, dinosaur digs and more. * Cheyenne Big Boots: Each of these eight-feet-tall cowboy boots has been carefully and colorfully painted by local artists to show Wyoming and Cheyenne&apos;s history. Go on a scavenger hunt and find them all. * Cheyenne Botanic Gardens: Located in Lions Park, this is an oasis on the high plains featuring nine acres of landscapes, gardens and plant collections. Children can explore the solar-powered conservatory and exterior gardens. This is also the home of Engine 1242, the oldest train engine in Wyoming. The Paul Smith Children&apos;s Village is a new feature at the Botanic Gardens. * Cheyenne Grizzlies: The Grizzlies are part of a summer collegiate baseball league with teams in Wyoming and Colorado. Each team features top collegiate baseball players from around the country. * American Legion Post 6 Baseball: Games are played at Powers Field at Windmill and Del Range Blvd. - Oregon Trail Ruts: Ruts carved into sandstone by wagon trains heading west along the Oregon Trail are located west of Guernsey, Wyoming, which is 98 miles north of Cheyenne. - Register Cliffs: A resting point along the Oregon Trail where early travelers stopped for the night and carved their names into soft limestone. - Fort Laramie National Historic Site: Just 80 miles north of Cheyenne, Fort Laramie was built in 1834 as a fur trading post. The military acquired it in 1849 and used it as a post from 1849 - 1890 to guard the wagons along the various trails that went through the area. - University of Wyoming High Plains Archaeological Museum: Contains evidence of the area&apos;s earliest inhabitants. - Chimney Rock National Historic Site: A famous landmark for weary travelers long the trails cutting through the region. - Fort Collins: Just 45 miles south of Cheyenne, the Budweiser Brewery is open to visitors. - Denver: A variety of attractions await travelers in the Mile High City, only 90 miles south of Cheyenne. - Rocky Mountain National Park: Includes 266,000 acres of stunning mountain scenery. This scenic park is perfect for motoring, horseback riding, hiking and mountain climbing. - Vedauwoo Recreation Area: Located 20 miles west of Cheyenne, known for spectacular granite rock formations that are perfect for sightseeing and hiking. - Snowy Range Ski Area: Located about 80 miles west of Cheyenne, offers downhill and cross-country skiing and snowmobiling. Summer is perfect for hiking and scenic drives. - Wyoming Territorial Prison State Historic Site: Beautifully restored, the park includes the 1872 Wyoming Territorial Prison that once held Butch Cassidy. - Saratoga Hot Springs: Soak in these hot springs located in the quaint towns of Centennial and Saratoga. - The Historic Plains Hotel: A proud fixture in Cheyenne since 1911 and a favorite among Wyoming&apos;s early captains of industry, cattle barons and oil tycoons. Recent renovations continue the tradition of serving guests with "Western High Style." - Terry Bison Ranch: Located on nearly 30,000 acres of rolling countryside spotted with more than 2,300 bison. Features good old-fashioned Western fun and overnight accommodations, including cabins, bunkhouse rooms and 86 full hook-up RV sites. - Little America Hotel: 80-acre luxury oasis complete with Olympic-sized pool and 9-hole golf course. Recent remodel and renovation includes: remodel of 188 guest rooms, remodel of entire main building and addition of Carol&apos;s Café, remodel of existing meeting space and addition of 26,000-square-foot convention facility that includes a Grand Ballroom. - Holiday Inn: 18,000 square feet of meeting space with on-site catering and a full A/V department, making it the ideal place for business meetings and conventions for up to 800 guests. - Historic Plains Hotel: Six elegant meeting rooms, 9,000 square feet of meeting and mingling space, and signature banquet menus. - Nagle Warren Mansion B&B: One of Cheyenne&apos;s most elegant residences, this Victorian B&B was built in 1888 and is listed on the National Registry of Historic Places. English High Tea is served on Fridays and Saturdays. - Curt Gowdy State Park: Located 24 miles west of Cheyenne in the picturesque foothills of the Laramie Mountains, this state park has reservable RV sites.